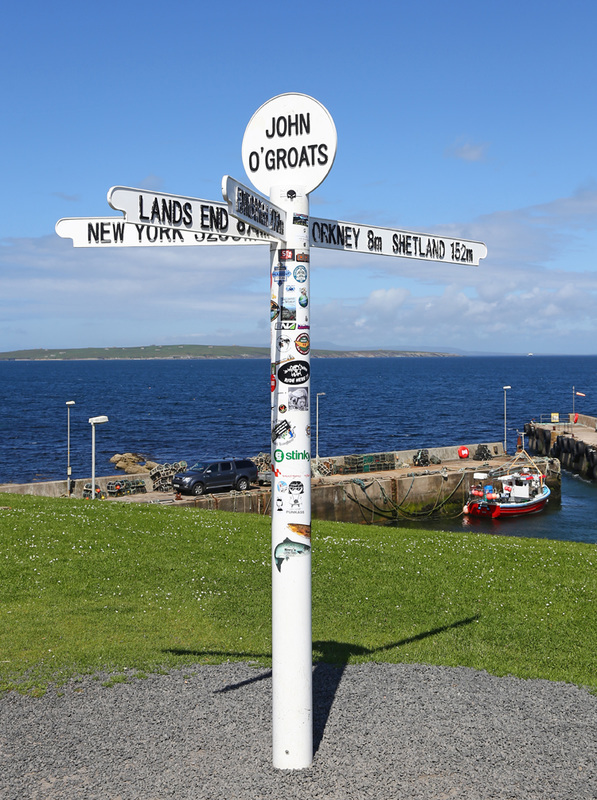 Between the 11th and 16th July I ventured to the far north of Scotland in an effort to visit the most northerly point on the UK Mainline (and Mainland! 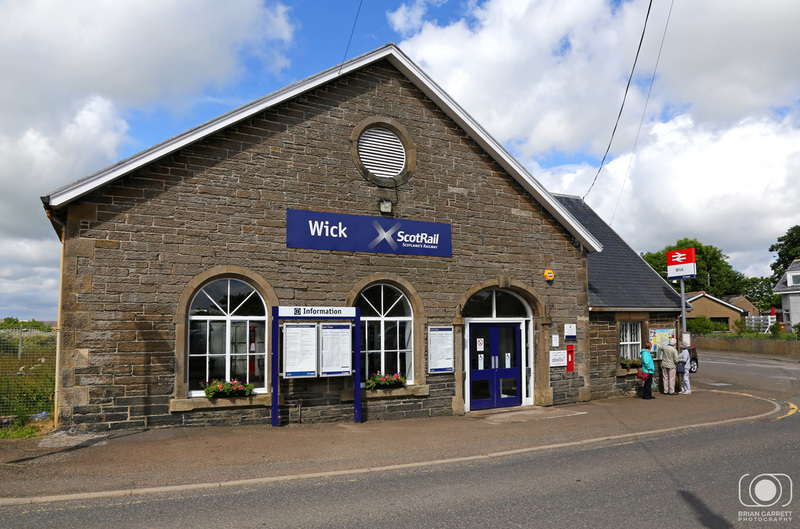 ), while this trip was in the planning it was decided if we were to make this trip then on the weekend beforehand we should visit Lands End so that we could claim the journey from Penzance to Wick by train. On Saturday 9th July we set of south from Taunton on a GWR HST set to St Ives before catching the branch line service to St Ives. 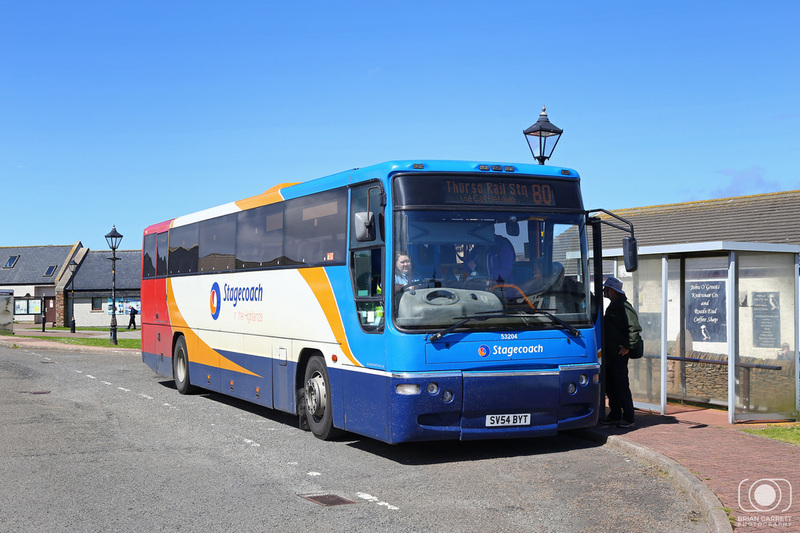 During the summer months First operate an open top bus (No.300) from the seaside town direct to Lands End. A group of ten attended this trip but the weather was less than kind to us on the day. Having visited Lands End we returned to Penzance on the No.1 'open top' service where we returned home using a GWR HST to do so. Sunday the 10th July was then spent getting ready for the Scotland portion of the trip which would start on Monday 11th July. 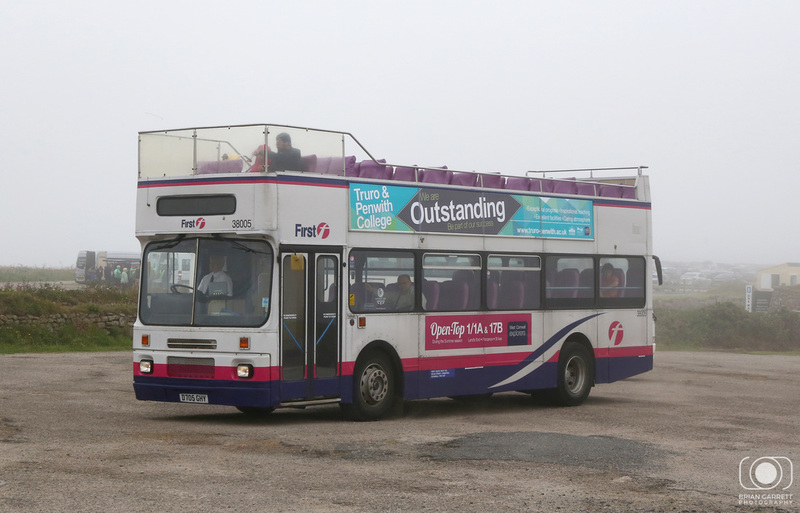 The aim was to reach Thurso and Wick from Inverness on the Tuesday before then visiting Kyle of Lochalsh on the Wednesday from Inverness and then travelling from Inverness to Haymarket via Aberdeen during the Wednesday afternoon/ evening. Thursday would then be spent exploring the Ayrshire Coastline, and nipping back into the England for a quick trip down the Cumbrian Coast. 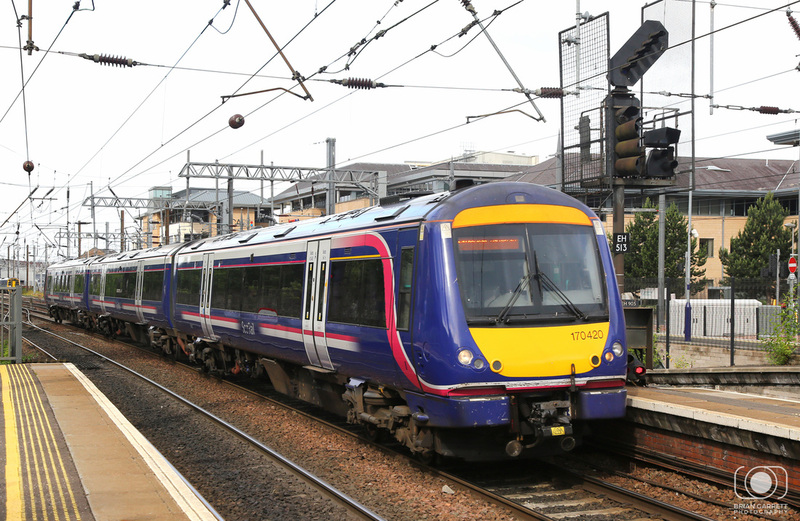 Friday would entail a visit to Glasgow and Tweedbank before a trip around the Fife Circle in the evening from Edinburgh. Saturday we would return to the South West travelling by Virgin East Coast HST from Haymarket to London Kings Cross before a quick trip across London to Paddington before returning to the South West on a GWR HST set. Monday 11th July saw three of us depart Taunton at 08:19 on board GWRs flagship service 'The Golden Hind' arriving into Paddington at 10:02, from there it was a quick trip on the Circle Line to Kings Cross, where we met up with our forth travelling companion in the First Class Lounge. 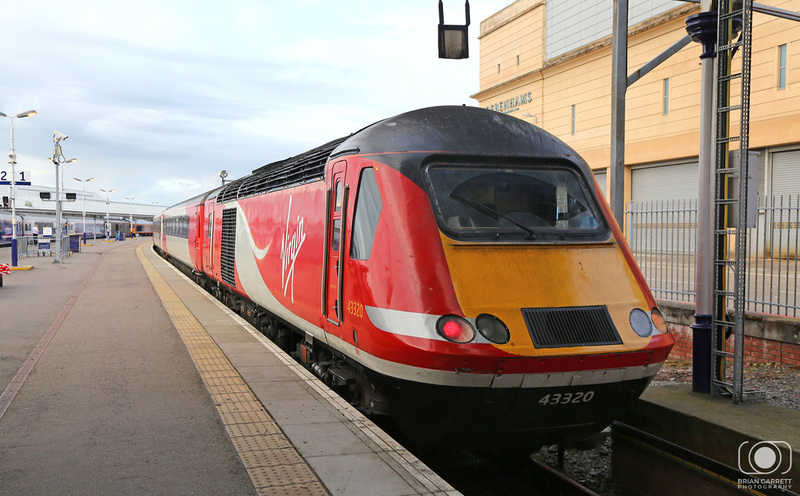 Because we'd booked so far in advance we'd managed to obtain good value first class tickets to travel on Virgin East Coast on board another flagship service 'The Highland Chieftain'. 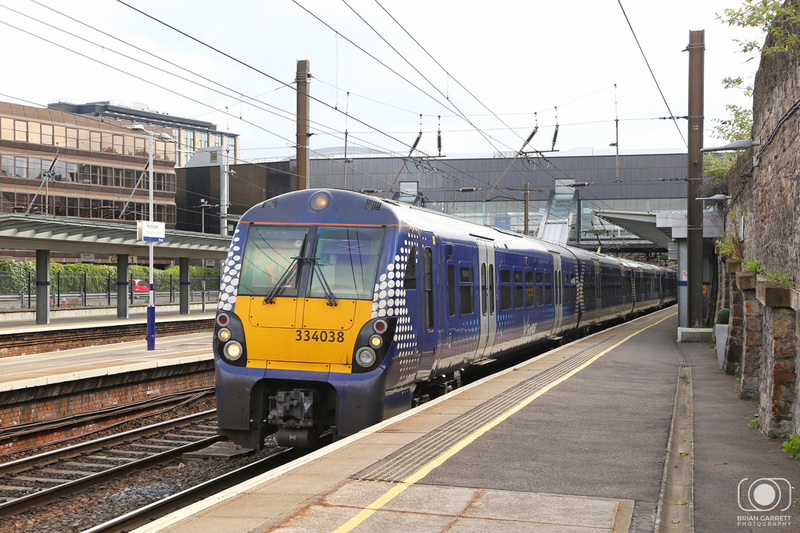 This service departs Kings Cross at 12:00 each weekday and takes eight ours to reach Inverness. 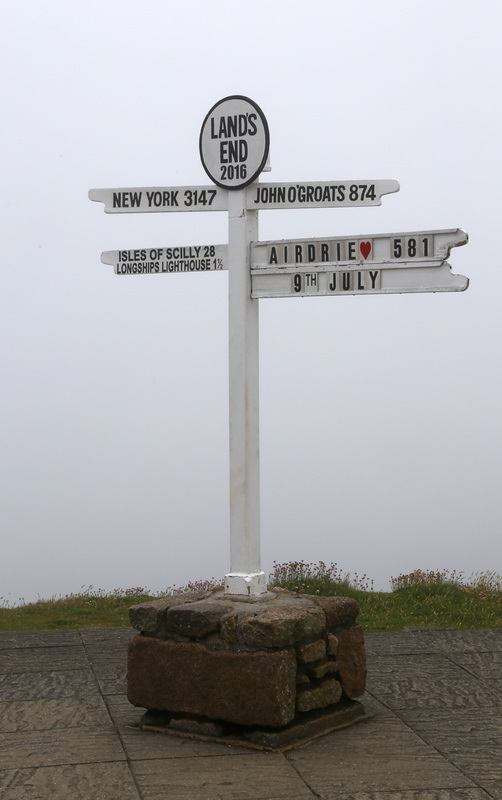 This was also our destination, and the furthest north we could sensibly achieve in a day. 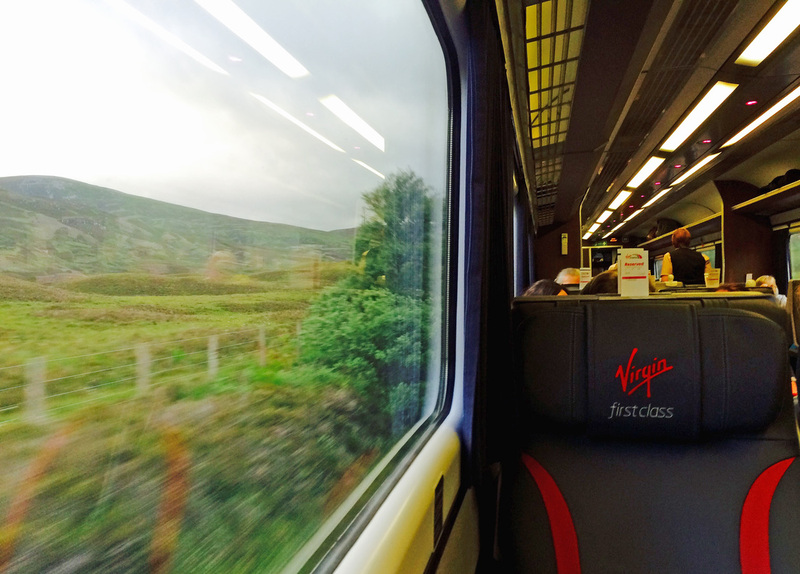 ​The Virgin First Class service is incredibly good and well worth the extra money and comfort for such a long journey. 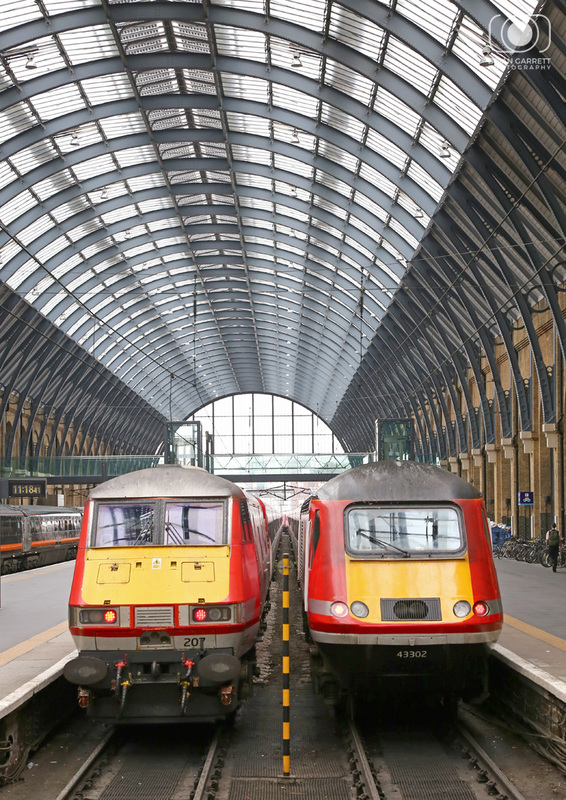 Virgin DVT No.82207 and HST No.43302 are pictured under the impressive refurbish roof at at Kings Cross. 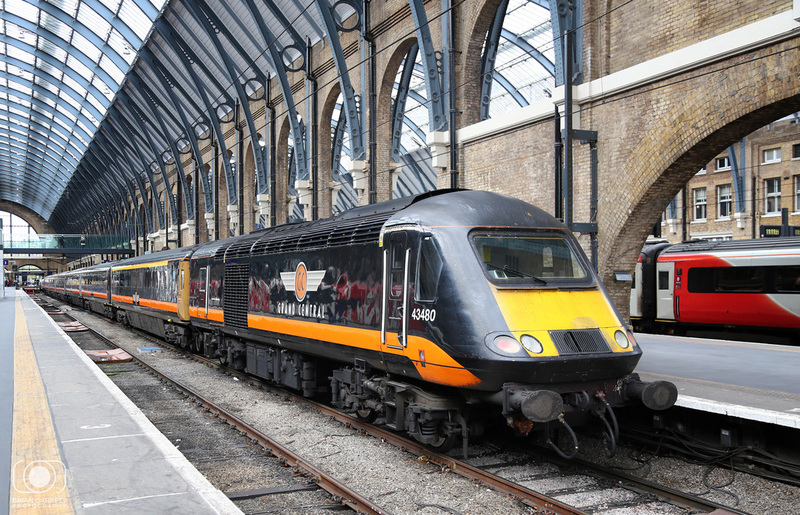 Grand Central liveried HST No.43480 stands at Kings Cross ready to depart witht the 1N92 to Sunderland. 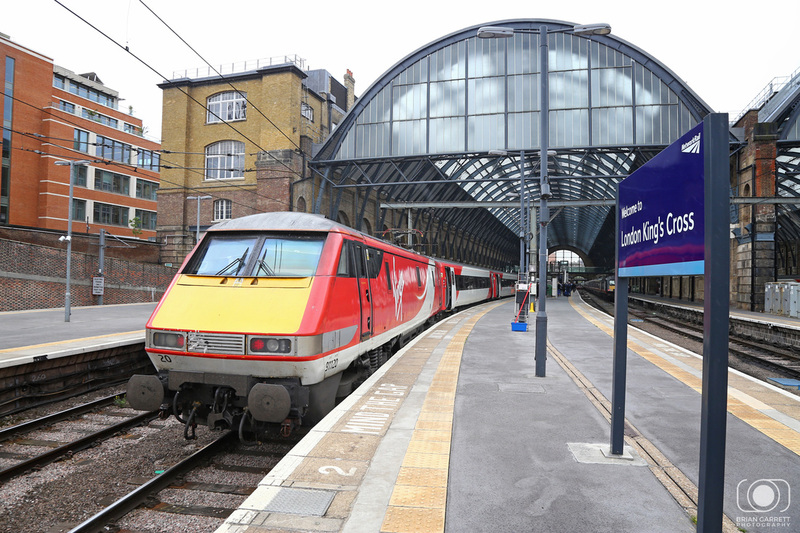 Virgin East Coast Class 91 No.91120 stands at Kings Cross. 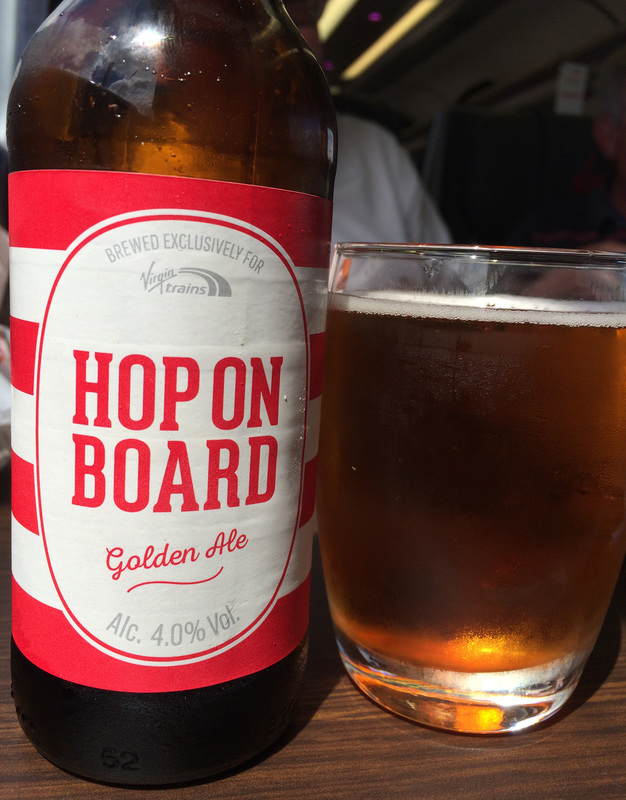 Virgin Trains have an extensive rotating menu in first class which has been devised by celebrity chef James Martin. 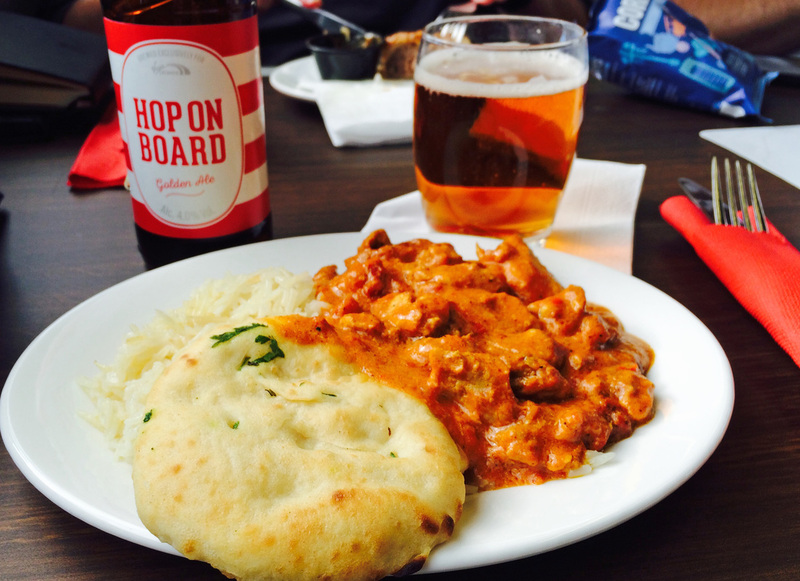 Along the many snacks offered on our service there was also the chance to enjoy an evening Curry and Virgin Trains own 'Hop On Board' ale which has been brewed exclusively for Virgin. Arrival into Inverenss is about an 45minutes before the Scottish Sleeper departs for London Euston. 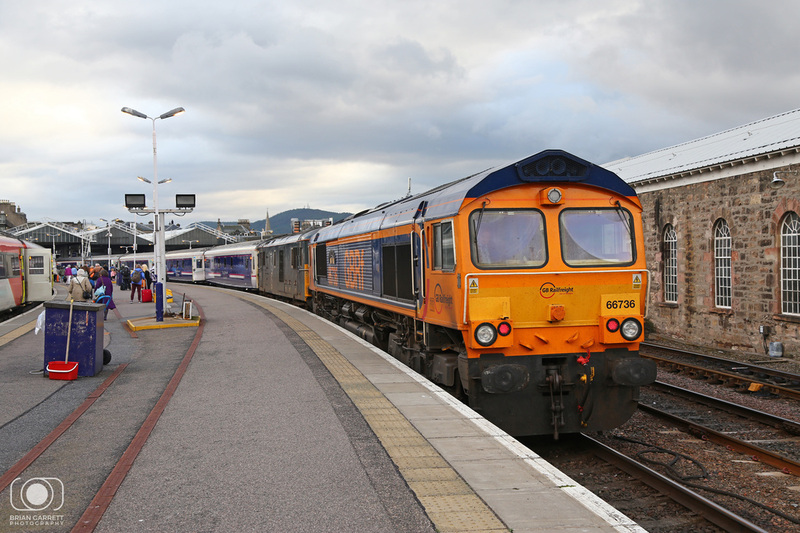 GBRf Class 66/7 No.66736 and No.73967 are seen at the head end of the 1M16 20:46 Inverness to Euston. 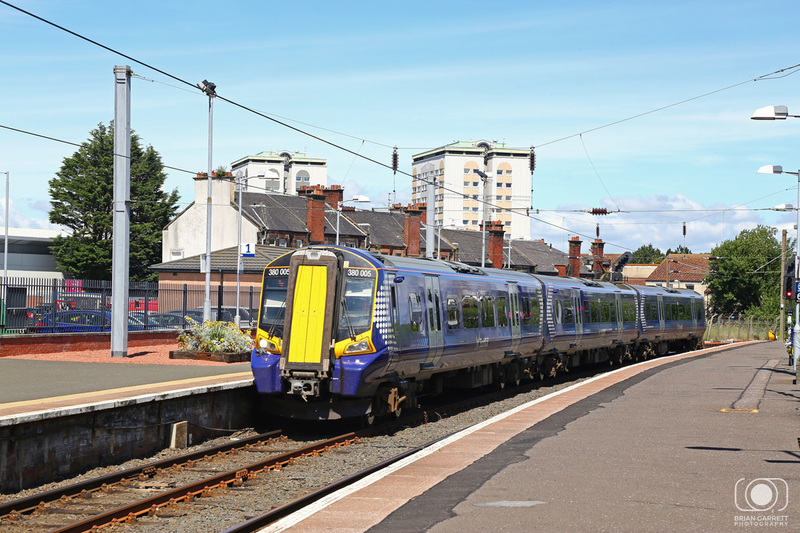 Scotrail Class 158 No.158707 prepares to depart with the 2H61 07:02 to Wick and Thurso. 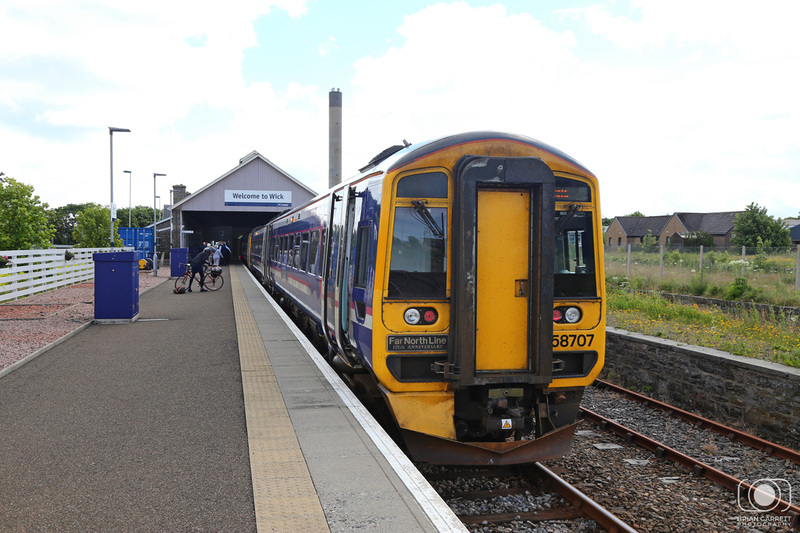 Class 158 No.158707 stands at Scotlands most northly station Thurso while working the 2H61 07:02 Inverness to Wick service. 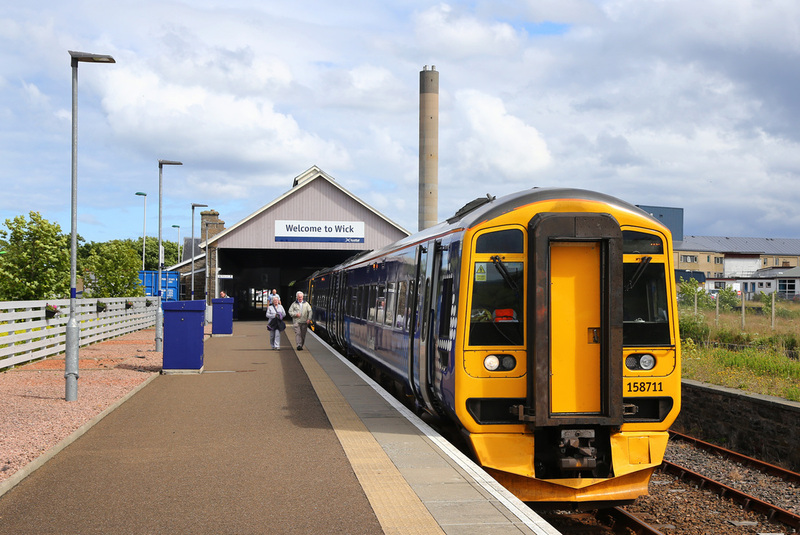 Class 158 No.158707 is seen at Wick having arrived on the 2H61 07:02 Inverness to Wick service. 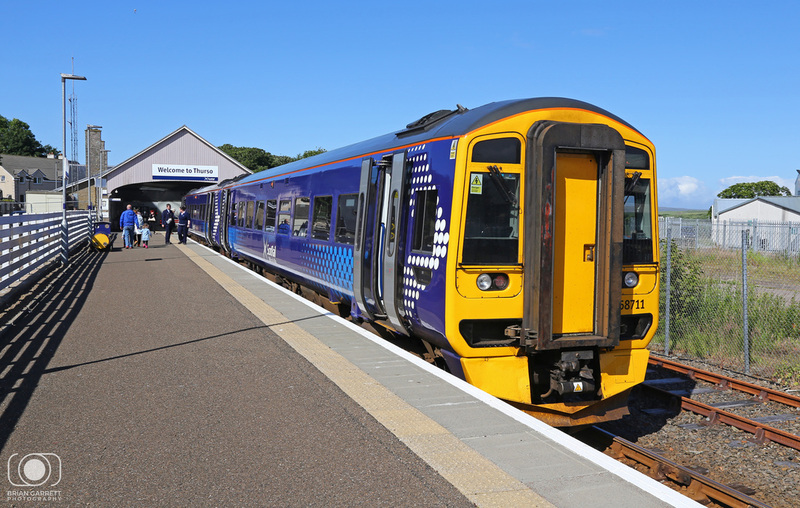 Scotrail Class 158 No.158711 stands at Wick ready to leave with the 2H64 16:00 to Inverness service. 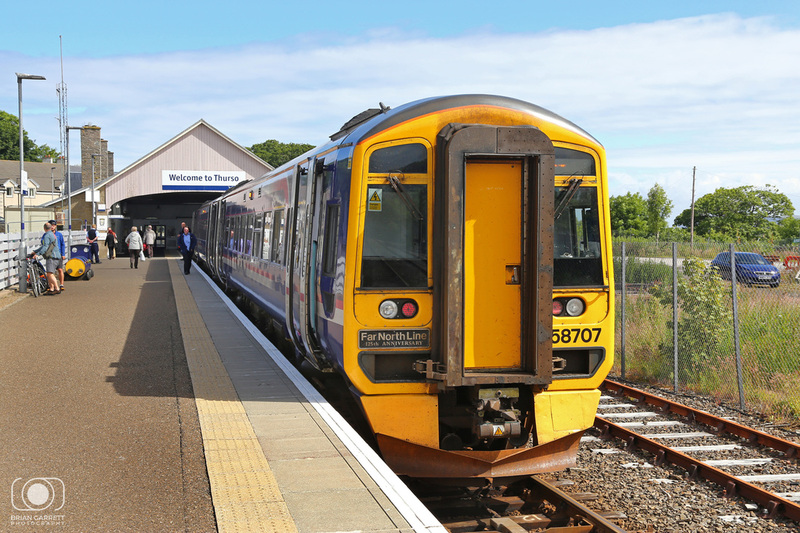 Class 158 No.158711 is seen at Thurso while working the 2H64 16:00 Wick to Inverness service. 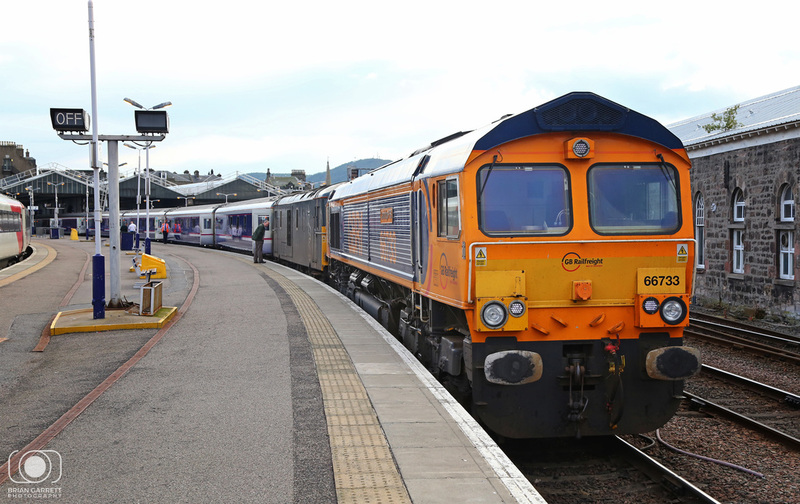 GBRf Class 66/7 No.66733 'Bolton Wanderers' and Class 73/9 No.73967 stand at Inverness preparing to depart with the 1M16 20:46 Scottish Sleeper to London Euston. 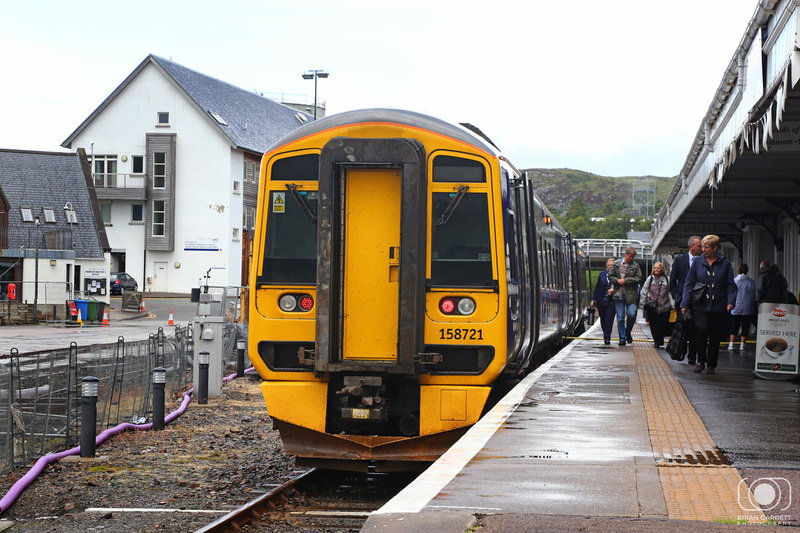 Class 158/7 No.158721 stands at Inverness ready to depart with the 2H81 08:55 to Kyle of Lochalsh. 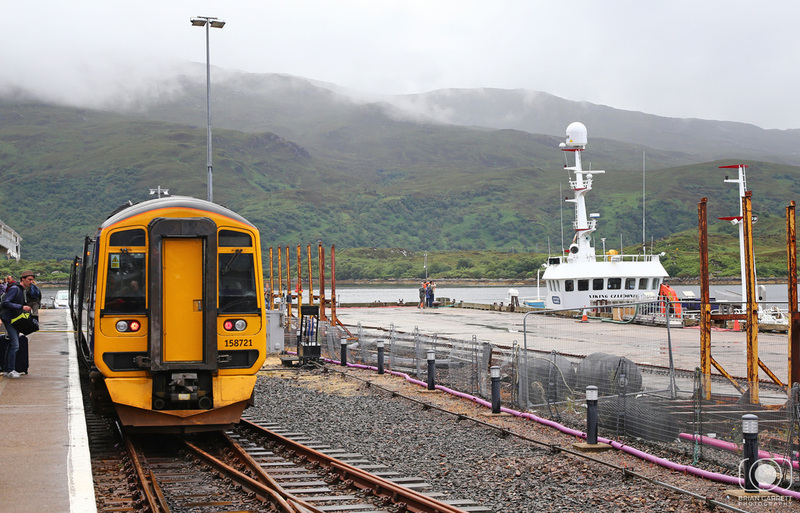 Scotrail Class 158 No.158721 is pictured at Kyle of Lochalsh having arrived from Inverness. 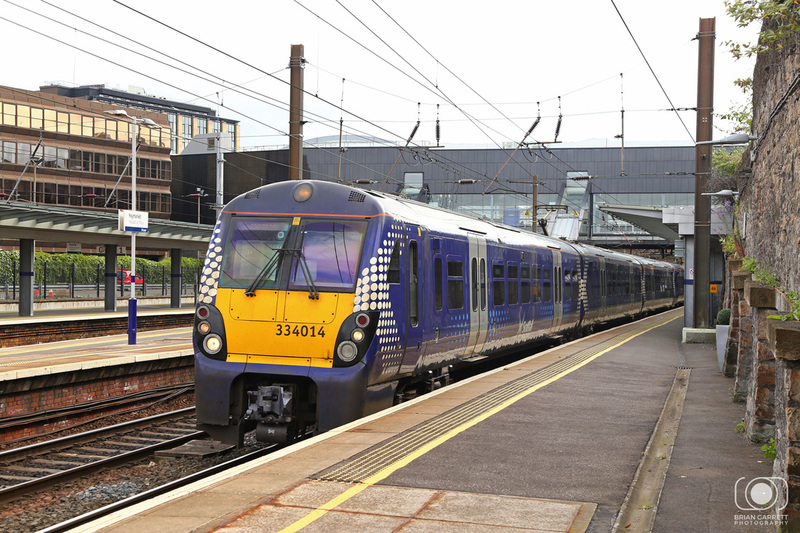 Scotrail Class 334 No.334013 deaprts from Haymarket on a Edinburgh to Milngavie service. 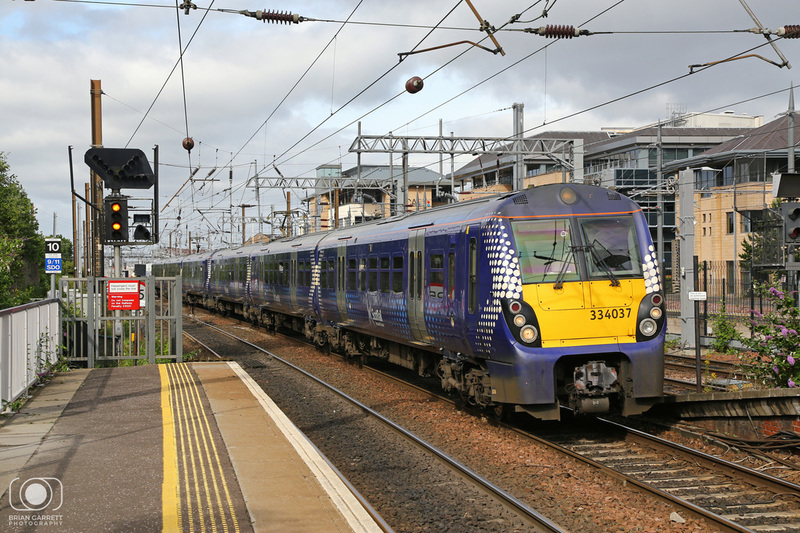 Scotrail Class 334 No.334012 and No.334018 arrive into Haymarket with a Milngavie to Edinburgh service. 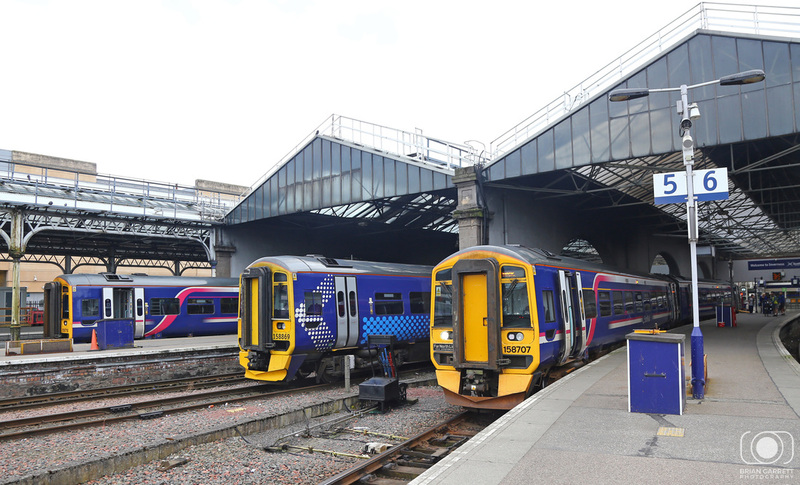 Scotrail Class 334 No.334018 Class 170 No.170417 and 170410 are all pictured at Haymarket. 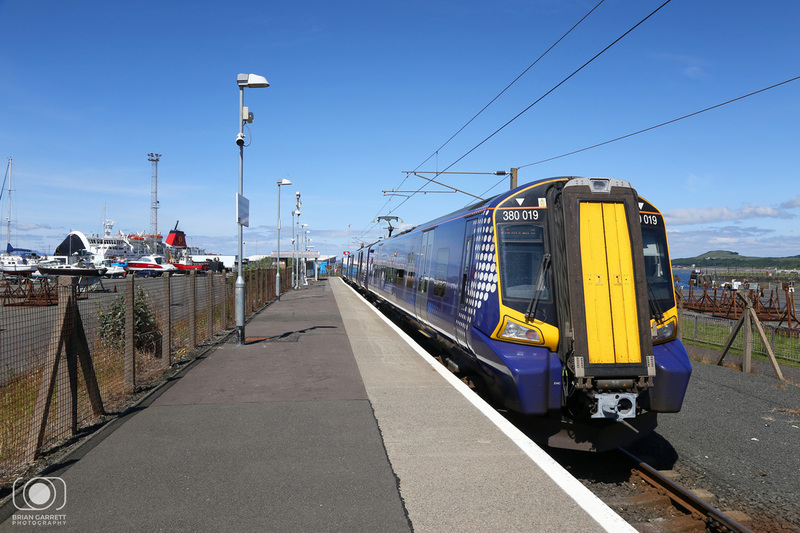 Sctorail Class 380 No.380019 is seen at Ardrossan Harbour working the 2Z62 12:22 to Kilwinning. 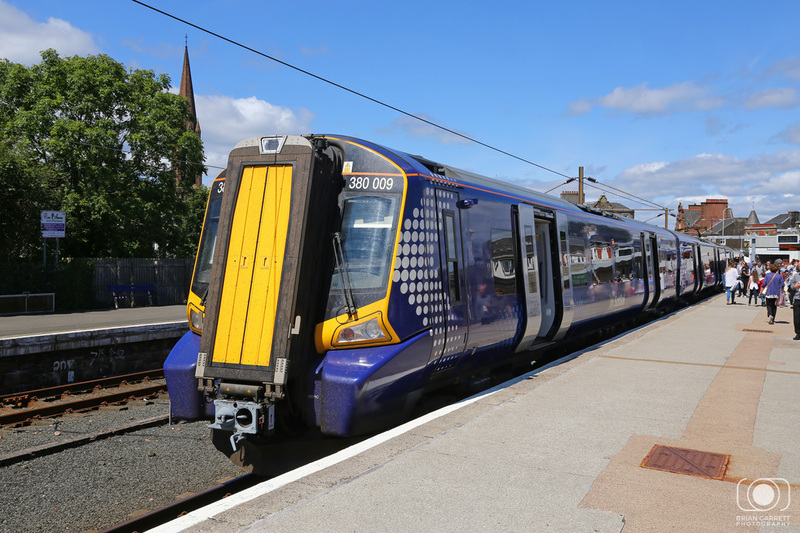 Scotrail Class 380 No.380009 is seen at Largs ready to work the 2Z22 12:53 Largs to Kilwinning. 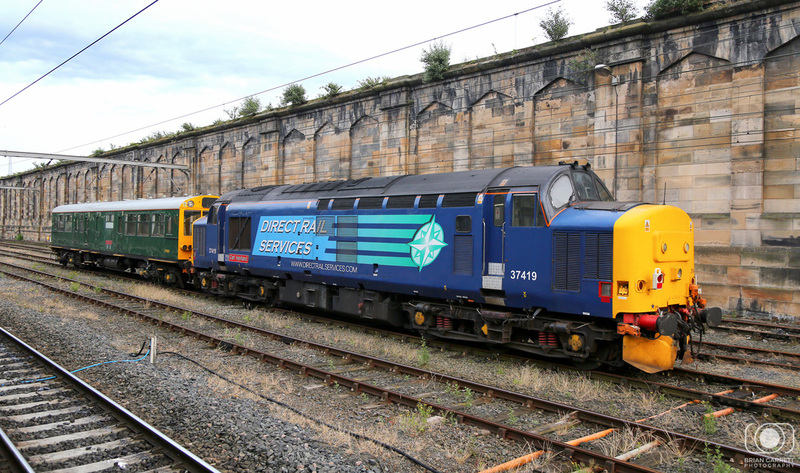 Direct Rail Servicers Class 37/4 No.37423 arrives into Carlisle with the 2C41 14:37 from Barrow in Furness. 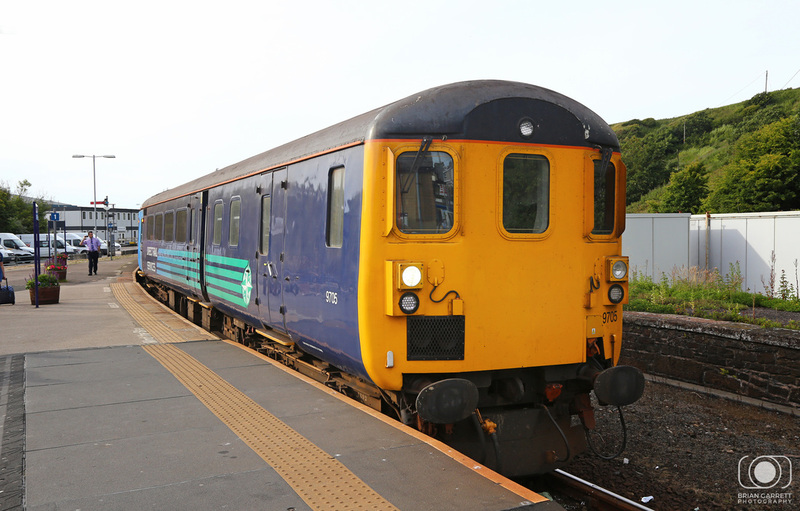 DBSO No.9706 departs from Whitehaven with the 2C42 17:37 Carlisle to Barrow in Furness. 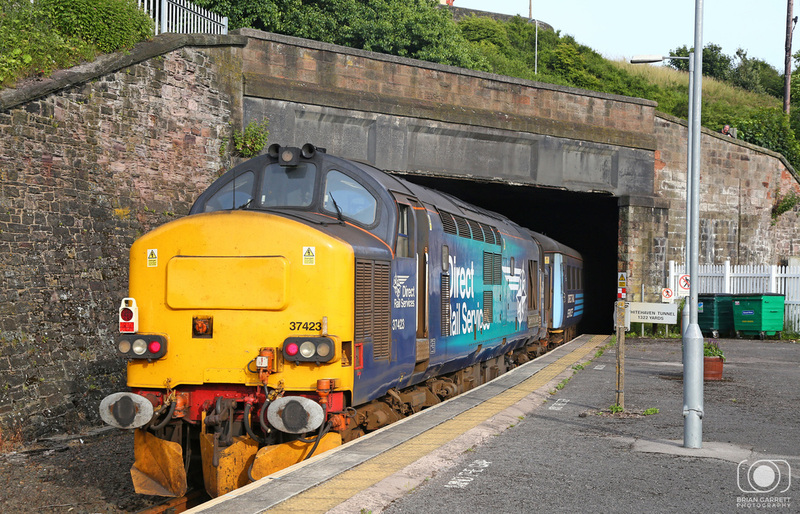 DRS Class 37/4 No.37423 pushes the 2C42 17:37 Carlisle to Barrow into the tunnel at Whitehaven. 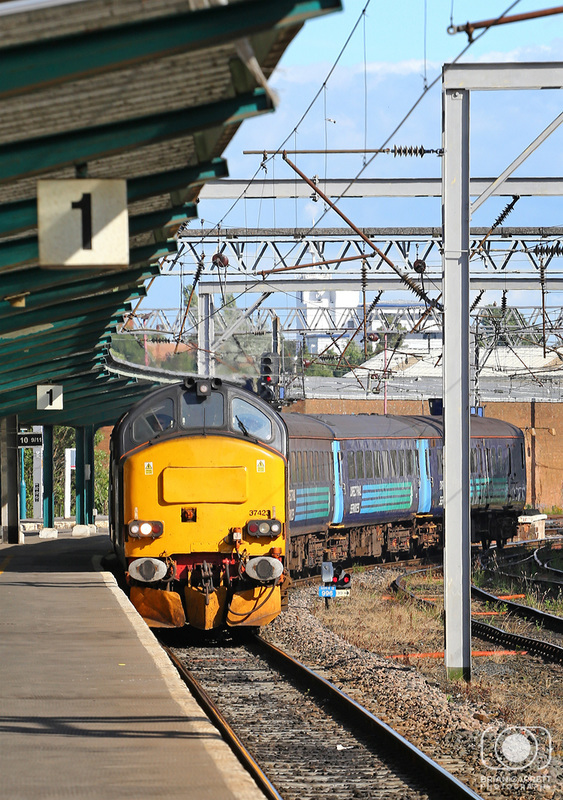 Class 37/4 No.37419 is seen stabled at Carlisle having returned from the Scottish Highlands with inspection saloon 'Caroline'. 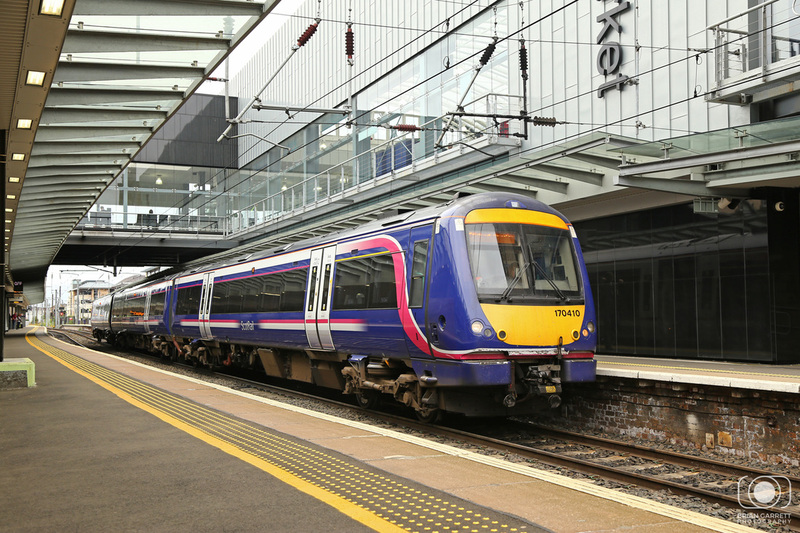 Former First liveried Class 158 No.158739 arrives into Haymarket Station from Edinburgh. 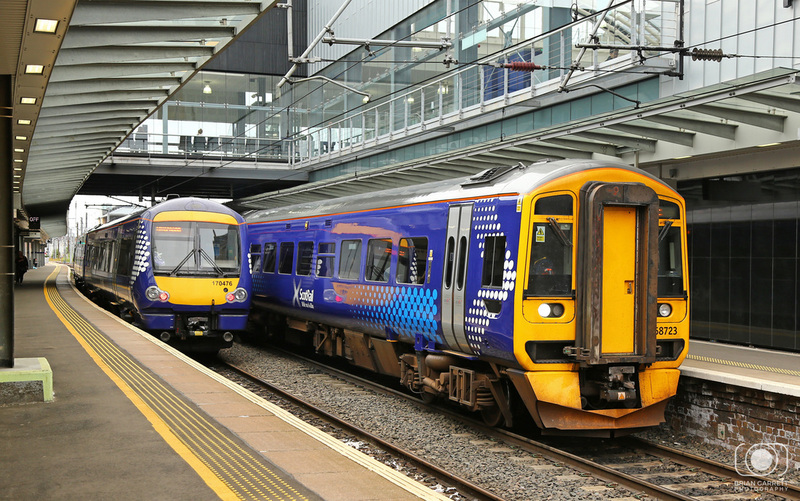 Scotrail Class 170 No.170414 is pictured at Haymarket on route to Edinburgh. 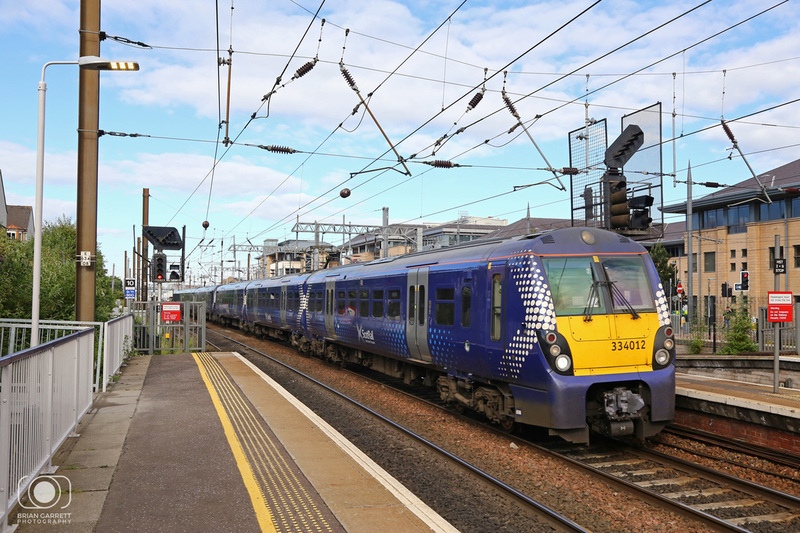 Scotrail Saltire liveried Class 170/4 No.170476 departs from Haymarket on route to Edinburgh. 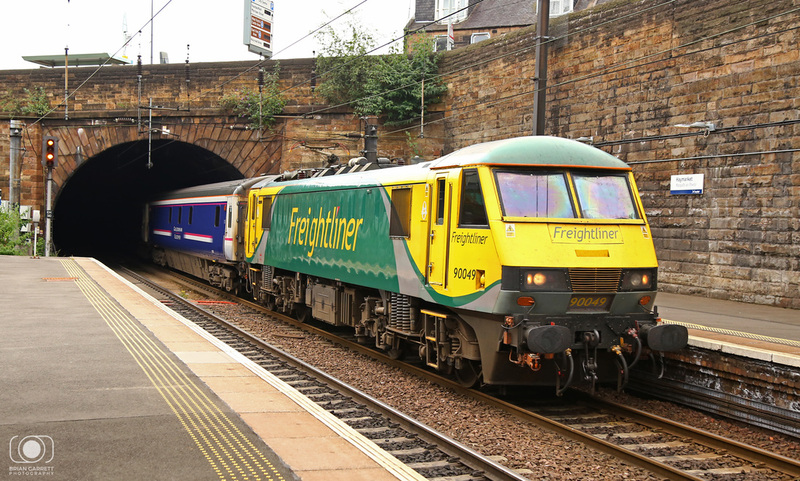 Freightliner liveried Class 90 No.90049 emerges from the Haymarket Tunnel with the 5B26 08:18 Edinburgh to Polmadie sleeper empty coaching stock service. 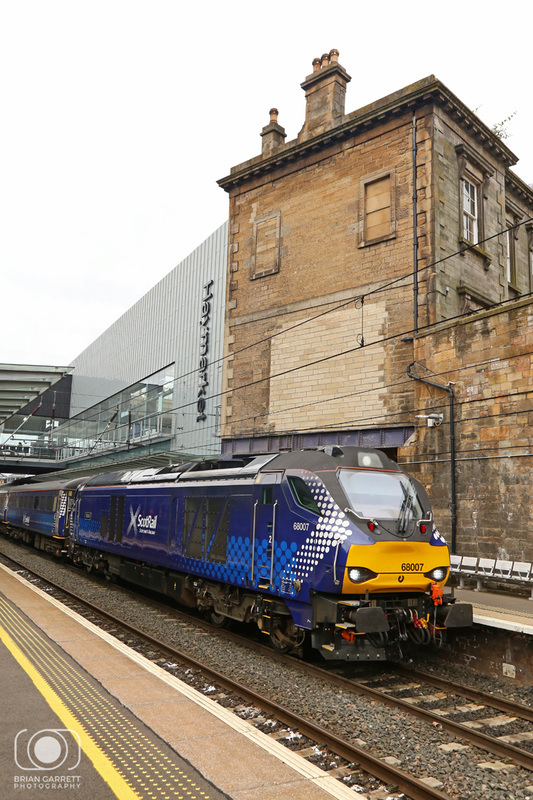 Scotrail liveried Class 68 No.68006 'Rapid' departs from Haymarket with the 2K18 07:35 Cardenden to Edinbrugh service. 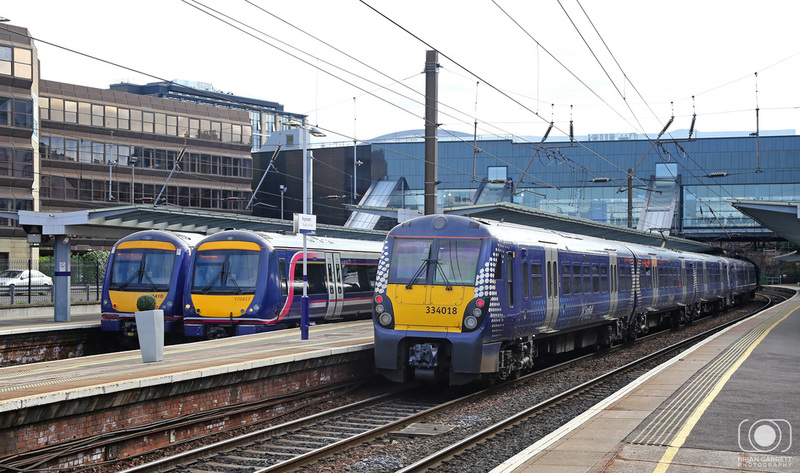 Scotrail Class 158/7 No.158723 and Class 170 No.170476 are pictured at Haymarket. 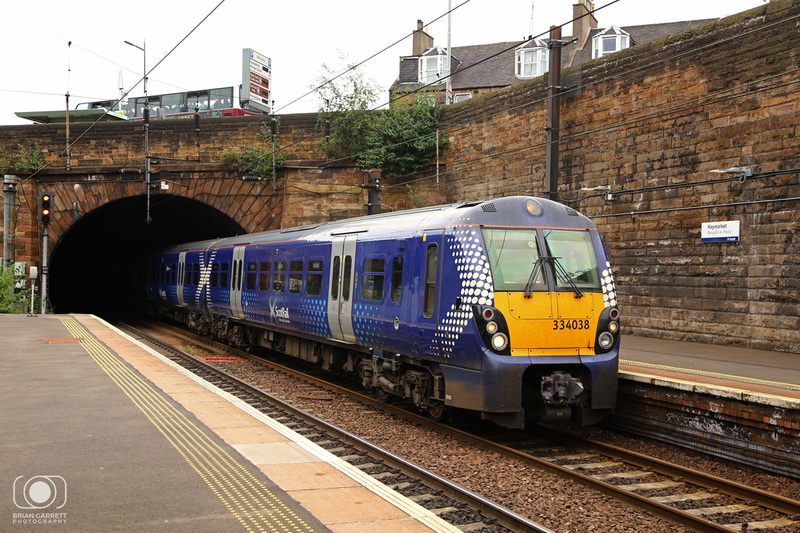 Scotrail Class 380 No.380105 exits from Haymarket Tunnel arriving from Edinburgh. 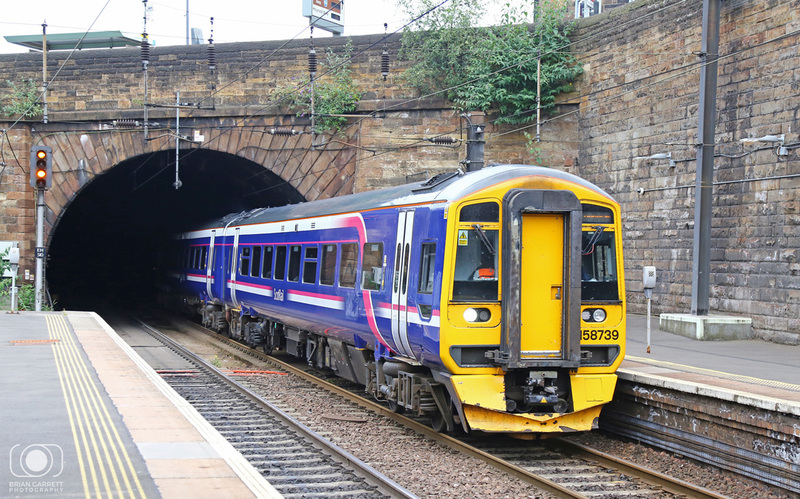 Scotrail Class 334 No.334038 emerges from Haymarket Tunnel with a stopping service to Milngavie. 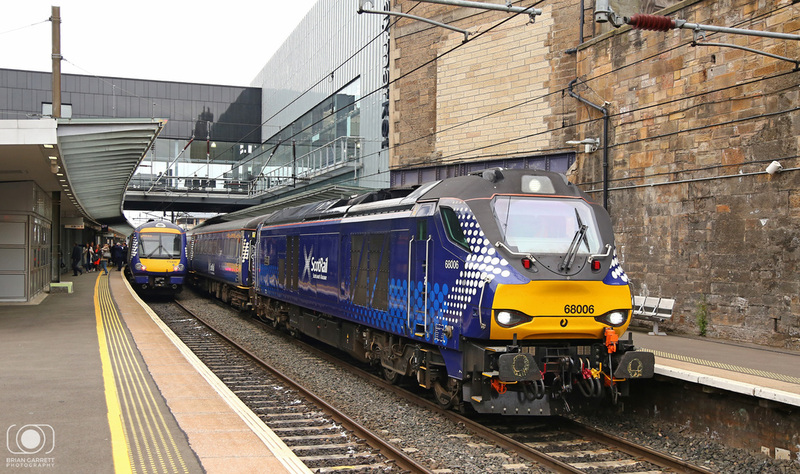 Scotrail Class 68 No.68007 departs from Haymarket hauling the 2G02 07:47 Glenthroes to Edinburgh. 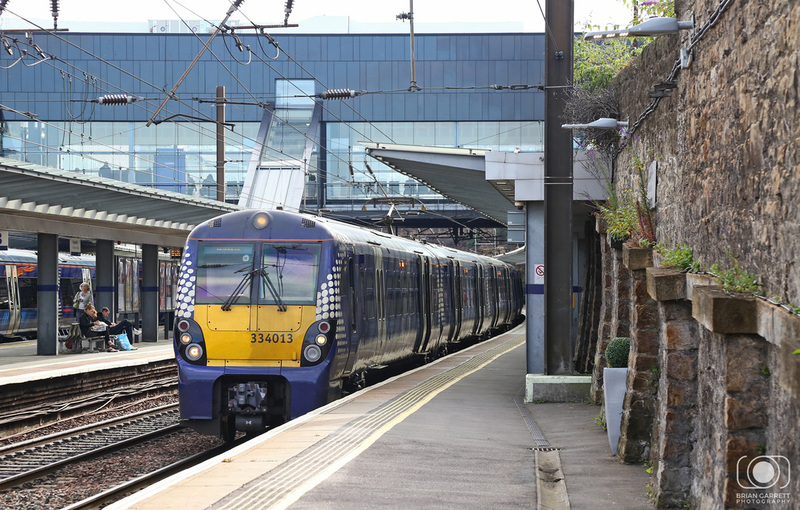 Class 170 No.170410 is pictured at Haymarket before departing to Edinburgh. 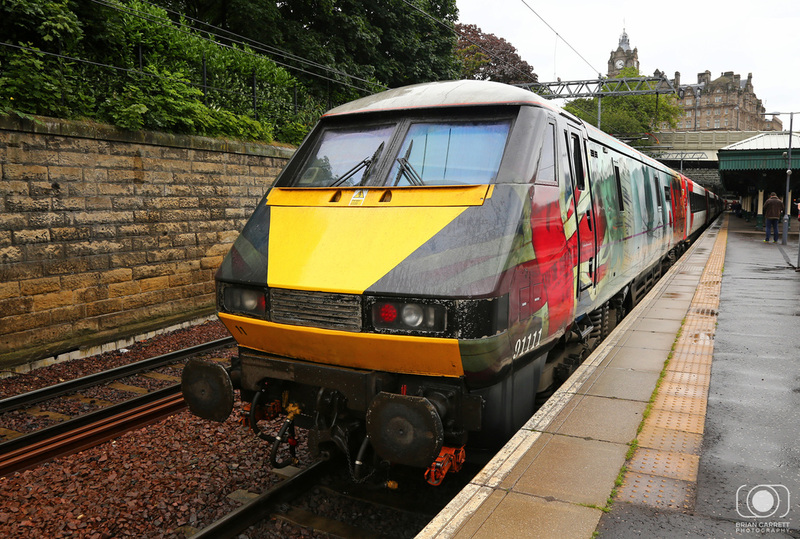 Virgin East Coast Class 91 No.91111 carries the 'For the Fallen' livery and is seen having arrived into Edinburgh. 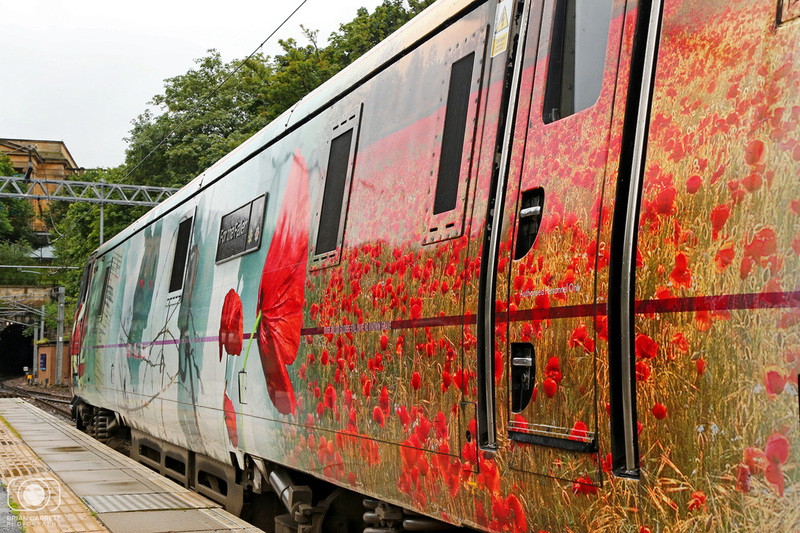 Virgin East Coast Class 91 No.91111 'For the Fallen'. 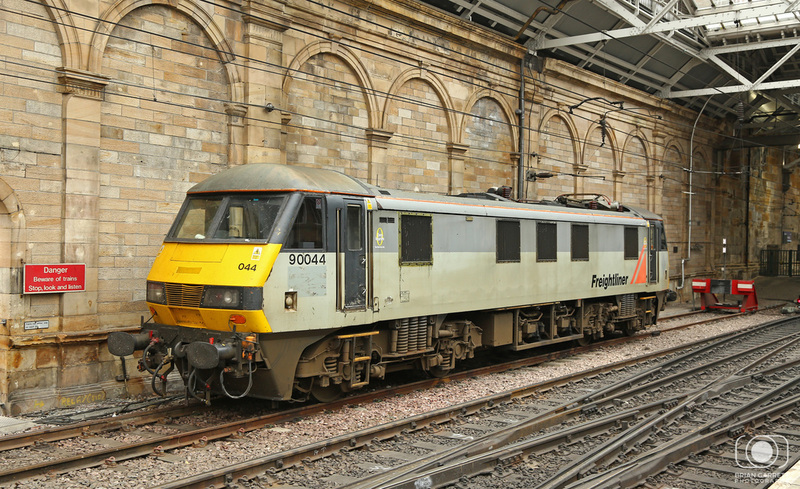 Freightliner Grey Class 90 No.90044 is seen stabled between passenger duties at Edinburgh Station. 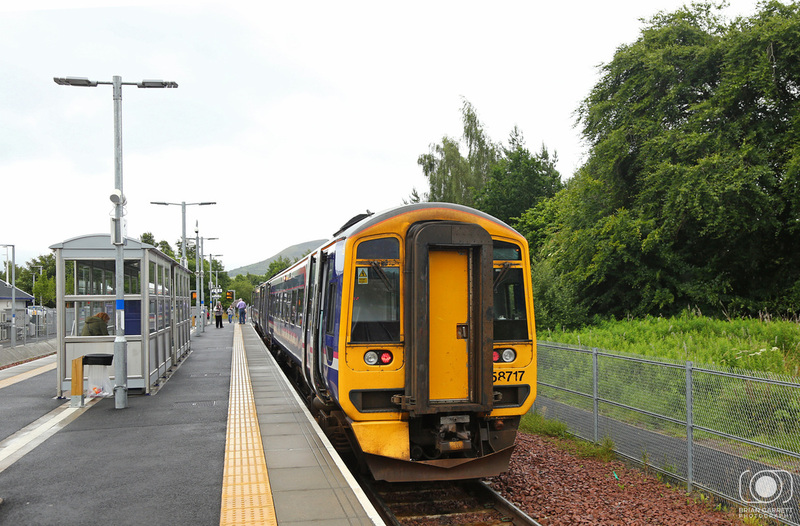 Class 158 No.158717 is seen at the newly opened Tweedbank Station ready to work the 2T93 15:57 to Edinburgh Waverly. 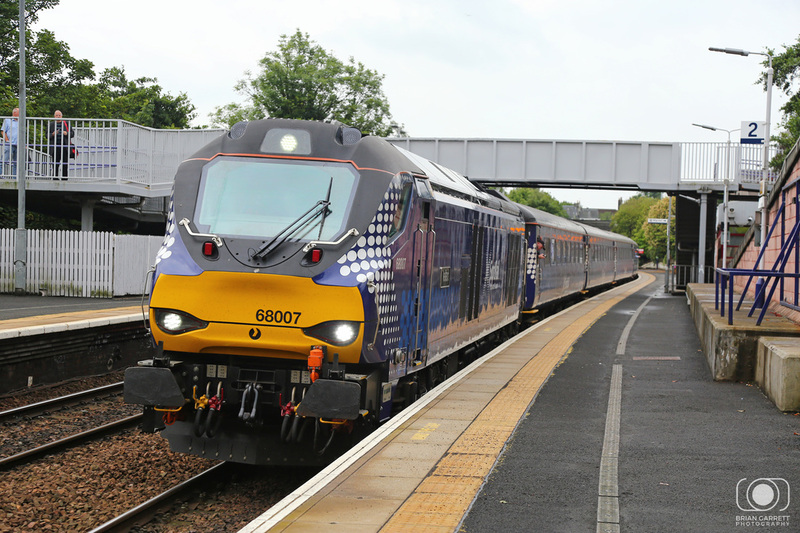 Scotrail Class 68 No.68007 departs from Inverkeithing witht he 2L69 17:20 Edinburgh to Cardenen, Fife Circle service. 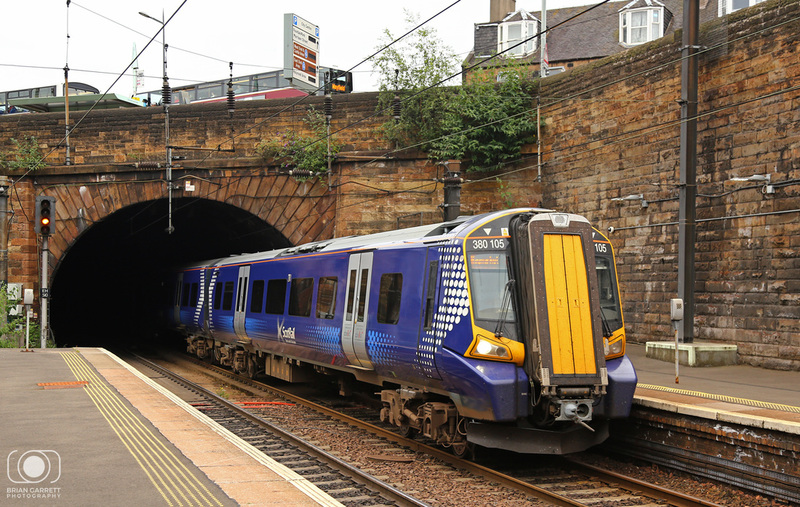 Scotrail Class 334 No.334037 arrives from Milngaive heading for Edinburgh Waverley. Class 170 No.170420 arrives into Haymarket Station. 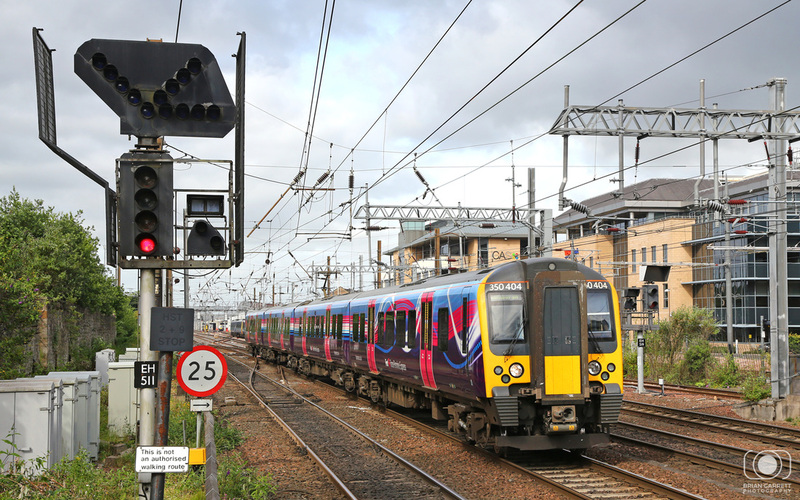 Transpennine Express Class 350/4 No.350404 arrives into Haymarket with a Manchester Airport to Edinburgh service. 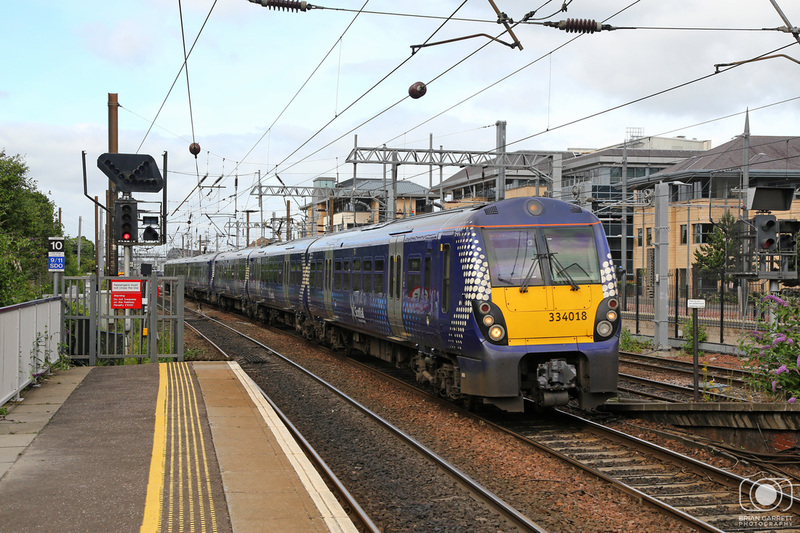 Scotrail Class 334 No.334014 departs Haymarket heading for Milngavie. 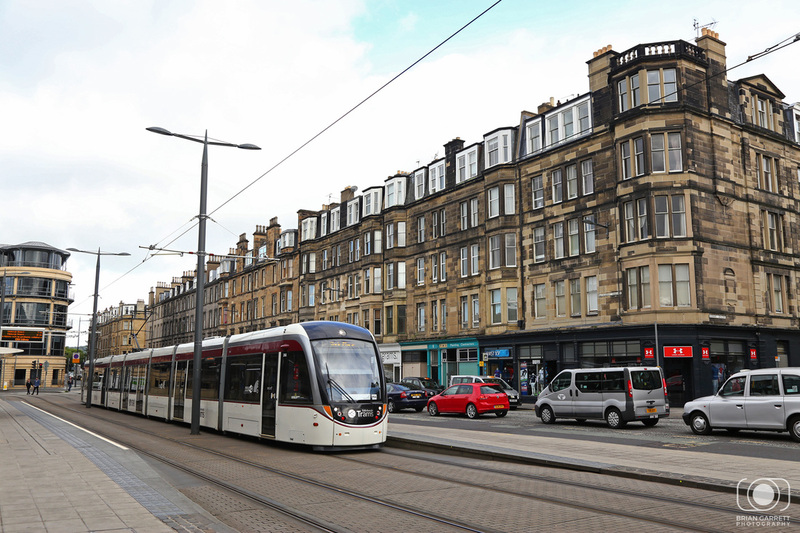 ​The Edinburgh Tram Network is a relative and well publicized newcomer the to the public transport network, media surrounding its expense, delay and disruption was in the forefront of Scottish news. But now the first stage of the system is built, and providing a direct link to the Airport, the benefits of clean, green, and efficient public transport in the city are already being felt. 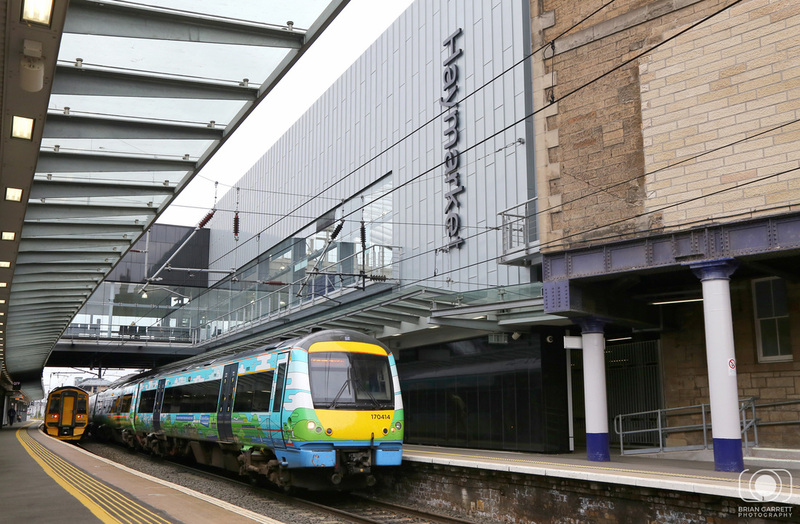 Plans were in place to operate a five minute frequency at peak times to increase passenger movement through the city. 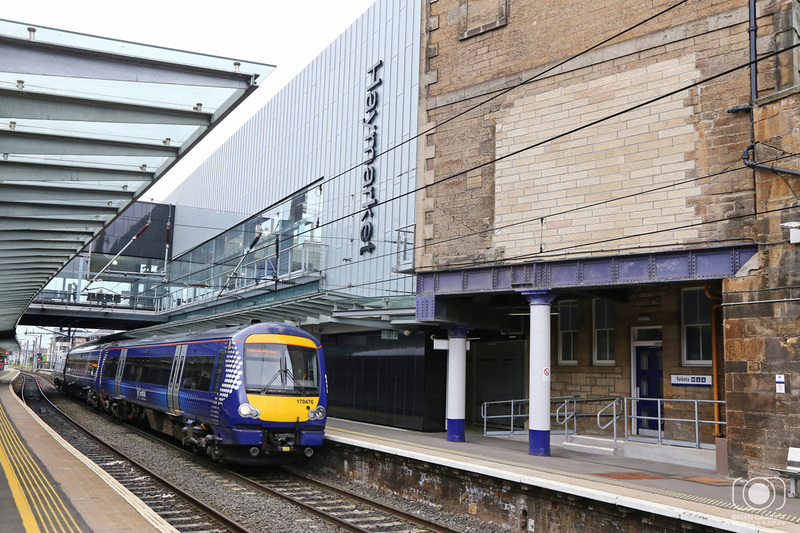 The line operates between Edinburgh Airport, through Haymarket and finishes at York Place in Edinburgh City Centre. 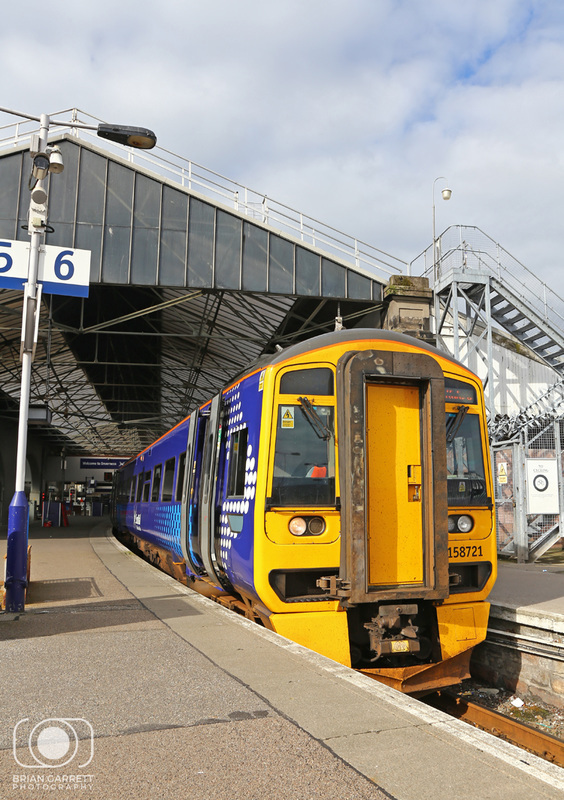 A day ticket costs just £4 (or £9 if you need to use the Airport Zone), which gives great value, tickets can be validated before travel by tapping conveniently placed card readers. The future of the Edinburgh Tram seems secure with increased frequency and expansion already being discussed. Fresh construction at the Airport end of the line is also bringing a mainline rail connection to the Aiport which will no doubt provide additional means of navigating between the city and the suburbs.